Now that school is out, you'll probably see a few more posts about parenting and a few less about quilting. That's just how it goes in our house. But don't worry, I'm sure I'll manage to sneak in some sewing here and there, and I won't take offense if you skip reading parental posts. 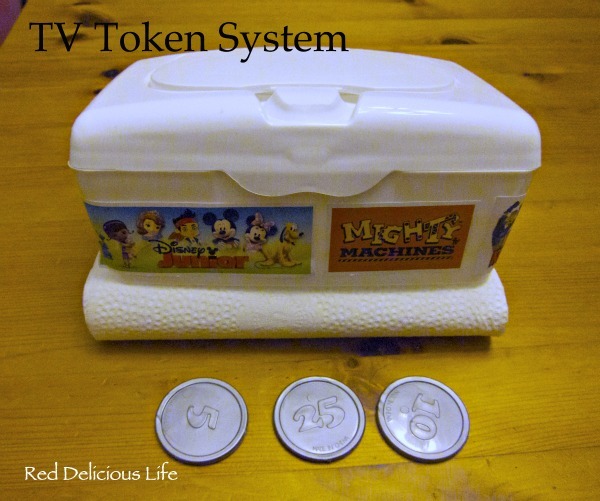 I'd like to introduce you to a system we put into place earlier this year: the TV Token System. For most families (in the US), summer is the time for kids to spend most of the day outdoors, exploring nature, playing tag, swimming, biking and everything else that goes with summer vacation. But when you live in Florida, that's not always the case. By 11am, the temperatures can get into the 90's and being outside for long periods of time just isn't pleasant so our afternoon adventures need to be indoors. My son loves TV but five year olds don't always understand the concept of time and having something visual and tangible was definitely the way to go so we use this token system for watching TV. We made a deposit box and decorated it with pictures of some of his favorite shows. This specific box is a bathroom wipes container from our potty training days. You could also use an old diaper wipe container or even a shoe box with a slot cut out of the lid. The tokens we use are from an old cash register toy but we ignore the money value on them. You can use cardboard cutouts, "magic beans" or whatever else you can think of. We then determined how many tokens he could have in a given day. We decided upon 3, and each token is worth one 30 minute show. Movies, like Finding Nemo, Frozen, and Cars, are worth 2 tokens. If there are tokens left over at the end of the day, they can carry over to the next day, with a maximum of 6 tokens on a given day. It's really helped to keep the amount of TV watching in check and there are less tantrums. Now it's not just me saying no you can't watch something just to be mean. It's whether or not he has any tokens left. It takes my authority out of the equation which I love. such a good idea, if honest I think I spend too much time with the TV on, mind you I am only listening whilst stitching! Oh Mama, It's June Already!